AMMONNEWS - Protesters on Thursday morning torched the office of the Civil Status and Passports Department in the city of Salt, northwest of Amman. A health clinic was vandalized in the town of Hanina in the northern governorate of Irbid. In Kufranja, northern Jordan, police clashed with protesters Wednesday night who attempted the vandalize local businesses after burning tires and trash containers in the main roads. 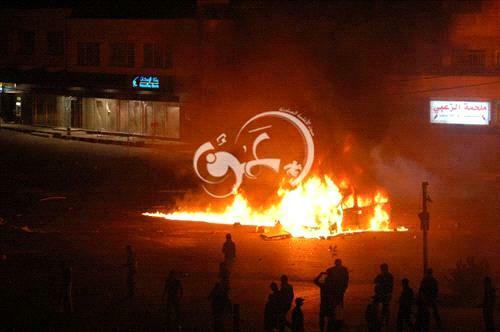 In Madaba, rioters burnt tires and vandalized bank buildings. In Sareeh, north of Jordan, rioters attack municipality building and license department building. In Nuzha district in Amman, protesters set police kiosk on fire and attempted to storm into Nuzha police station. In Karak, protesters attempted to storm into the security station to release arrested protesters. Eye-witnesses reported that a fire broke out in the Department of Education building in Karak city. Ammon News Correspondent in Karak Mohammad Khawaldeh reported that riots broke out in Al Marj District in Karak, with protesters vandalizing bank buildings and the office of the Social Security Department. Rioters also raided the offices of the Islamic Action Front political party, vandalizing its property, IAF spokesperson Bassim Qarralah told Ammon News. Gendarmerie forces used tear gas to disperse crowds. A riot policeman was reportedly shot during riots in Southern Mazar district, and was rushed to Al Hussein Medical Center in Amman, Ammon News has not yet been able to verify the report.